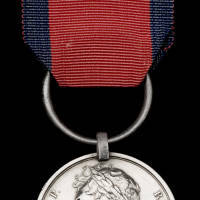 Awarded for service in Southern Africa from 1834-53. In particular, the 12L served in the campaign from 1850-53. Of special interest is the sinking of the troopship Birkenhead on its way from Simons Town to the Eastern Cape (26 Feb 1852) and which was carrying, inter alia, men of the 12L.